Many of my 3P figures use faction stickers that are independently purchased. I have used both official (such as Ocean Designs) and unofficial (such as TOYHAX) stickers. For the most part they do the job. But once in a while I wish they could be better. 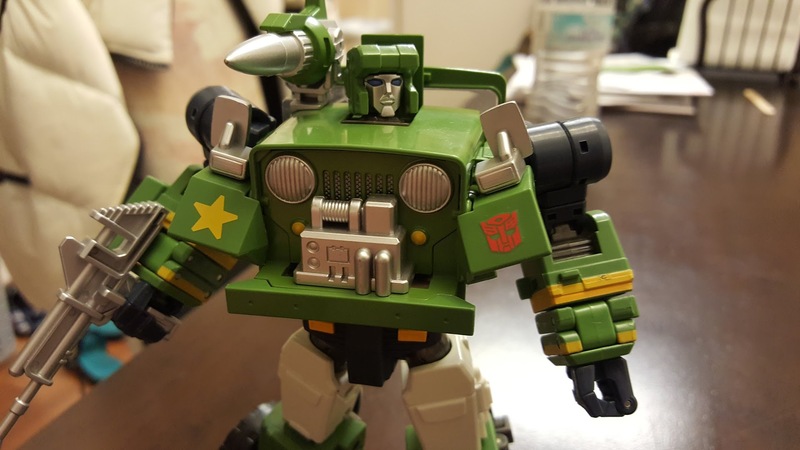 Take MakeToys Gundog, for example. 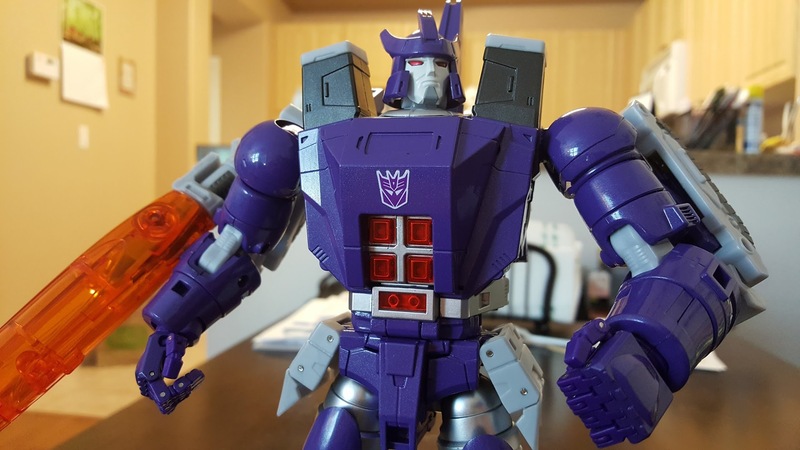 The figure is seen in last month’s post with an Autobot faction sticker applied. It looks ok, but it can certainly be improved. My buddy Gemini recently introduced me to rub on decals of faction symbols. He got some and was super impressed with the results. This I had to see for myself, so I got some too. The sheet of decals appears below. I forgot to take a pic of mine before I started using them, so here I’m using the pic that Gemini took of his. The full sheet is pretty big, about the size of a standard 11″ by 8.5″ piece of paper. 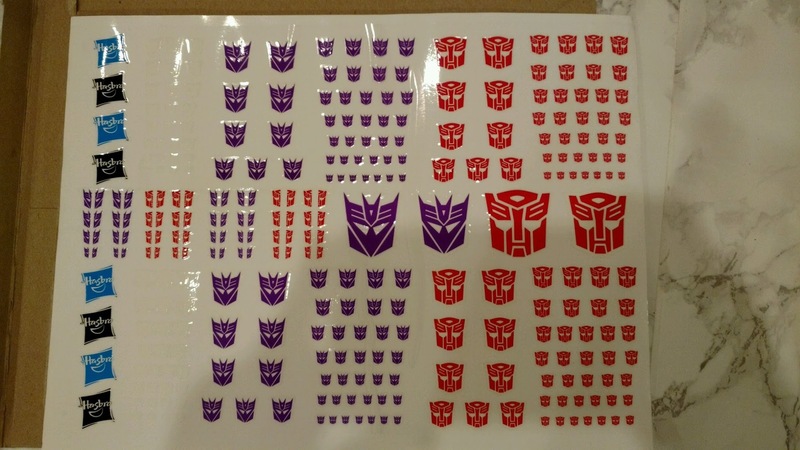 They decals are organized into 3 sections. Decals across the top section are all clear backing, and across the bottom section are all white backing. Those in the middle section is a mix of clear and white backing. Notice on the left hand side are some Hasbro logo decals. I used these for practicing before I really applied one. Not sure why anyone would want to put Hasbro logos on anything. 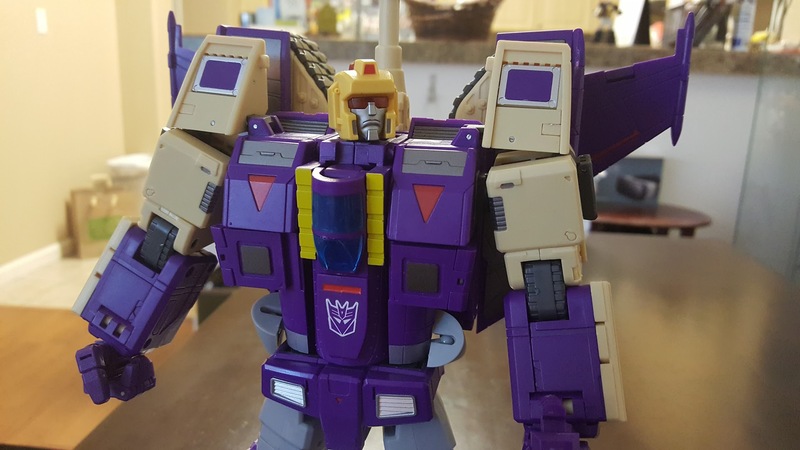 I peeled off the Autobot sticker on Gundog and applied the rub on decal. The results are amazing! He looks way better. After application, they have a slight 3D look to them, as if they are engraved or molded on. Very very cool. Take a look at the pics below of some 3P figures using rub on decals. It does take a bit more skill to use these decals, though. Lining up the faction symbols so they are in alignment can be tricky. Often times, your first try can be off center, in either position or rotation. They also don’t peel off easy. I don’t know of an easy way to get them off once they’re applied. Despite these negatives, using rub on decals are still the way to go. They look many times better than stickers. I highly recommend them for use with your 3P Masterpiece style figures.